In our overly-materialistic culture, minimalism is a growing counter-trend which deliberately rejects the concept that more possessions correspond with greater wealth or personal happiness. In fact, minimalism believes the opposite: less equals more. 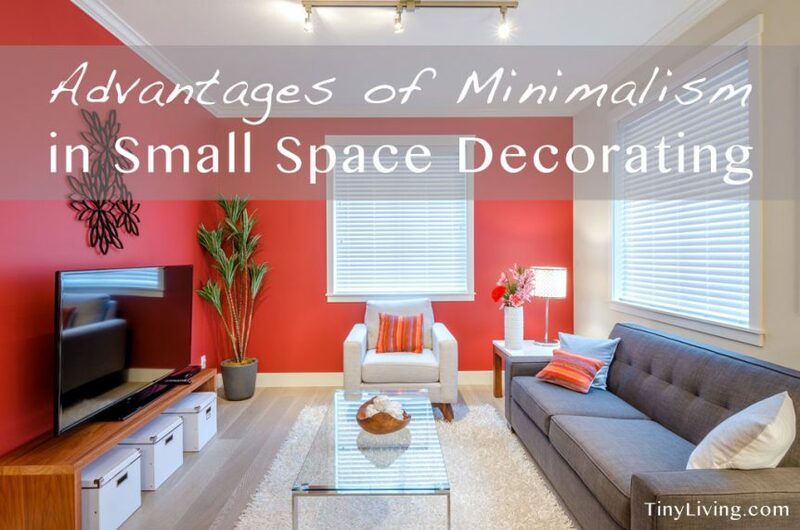 You can apply this concept to many areas of life, but I’d like to focus on the advantages of minimalism when it comes to decorating your small living space. You would think living in a small space automatically results in minimalism: less space = less square footage = less places to put things. Not so. If you move into a small space without changing the way you approach décor, the result will probably be a cluttered, cramped, busy, un-inviting environment, no matter how many ‘homey’ knick-knacks. Minimalism requires deliberateness in decorating regardless of the size of your home, but small places especially benefit from putting this philosophy into practice. According to American playwright Clare Boothe Luce, “simplicity is the ultimate sophistication.” You only have to look as far as modern showrooms and interior design magazines for pristine examples of minimalism in décor. This is the new standard, the epitome of class and sophistication, and seems to coincide with our cultural redefinition of what it means to ‘have it all.’ Cluttered spaces are no longer an impression of wealth, but of excess, and suggest an undisciplined life. Living in a small space, you are a prime candidate to gain this sense of high fashion, the approach of art. Achieving this look in your décor isn’t always as simple as it seems, but it can be done. ‘Getting organized’ has to be one of the top ten New Year’s resolutions of all times. When you downsize décor, you achieve at least some sense of organization, regardless of what your habits are, in general (fewer décor items equals fewer items to organize). You could still have disorganized clutter stuffed into small spaces, out of sight, but there will be less places to stuff it. At the very least, you’ll appear to be organized. Need I mention there will be fewer things to dust, and more free time? Featuring fewer décor items draws more attention to subtle details in your apartment’s structure, and unique pieces you own. Does your place have a picturesque view or an elegant chandelier? Choosing a focal point and minimizing everything else gives you the ability to create a stunning effect. Perhaps you have an amazing piece of original art competing with other items in the room. Taking away décor that detracts from these show-stoppers will allow them to truly shine (and encourage that sophisticated look you’re aiming for). Say ‘space’ to a small-home resident, and their eyes will light up. This buzzword is a precious commodity, and we’d do anything to get more of it. It’s amazing how much bigger places seem when they’re empty, or nearly so. And yet, what do we do? Fill every nook and cranny of that precious space. I love to decorate, but in my enthusiasm for creating an artistic, aesthetic home, I can go overboard. Would it hurt to leave a little of that space untouched, just for the sake of having space? Adopting minimalism in your décor doesn’t just leave you with more space. It will make it look like you have more space than you really do. Free space. Space squared. Now who doesn’t want that? Very nice, well written article. Your personal experience with living in small places shines throughout.